Ensuring that all Americans have access to healthcare will be one of the most important issues in the Democratic presidential primary and the 2020 election. It is unlikely that a Democrat without a viable plan can win the nomination. While some candidates are looking toward European countries for inspiration, an answer to the uninsured crisis may be found much closer to home. One large US city has already achieved universal access to healthcare. Over the last decade a program called “Healthy San Francisco” (HSF), working in tandem with the Affordable Care Act and other state and city programs, has ensured that nobody inside city borders has to go without care. The program was first proposed in February 2006 by then–Democratic Councilmember Tom Ammiano, with the strong support of labor unions and citizen groups that were frustrated by the gridlock on expanding access to healthcare at both the federal and state levels. With then-Governor Arnold Schwarzenegger vetoing single-payer legislation and the iffy prospects of passing any kind of healthcare legislation at the federal level, the city felt a need to act. Since then, HSF has, in part at least, served as a model for local health initiatives in other parts of the country. The premise behind HSF is simple: It offers access to healthcare to city residents who are 18 years and older, earn up to 500 percent of the federal poverty level, and have no other healthcare options. It is offered to qualified residents regardless of employment, immigration, or health status. Under the program, nearly three dozen San Francisco community health centers and six hospitals take care of about 14,000 patients. Supporters saw the program as a way to better coordinate the services of the health facilities already in place in San Francisco, rather than starting from scratch. Funding for the program comes from multiple sources. They include the city’s general fund, an employer mandate, and fees contributed by the participants. In a recent fiscal year, the city’s general fund paid out $27 million to the health plan, while San Francisco employers contributed $15 million through the employer mandate, and participants kicked in $2 million in fees. “San Francisco is lucky because we have a county public hospital and we have a large network of both city-run Department of Public Health clinics and nonprofit health centers,” Merrill Buice, director of health coverage care and access at the San Francisco Community Clinic Consortium, told WhoWhatWhy. One key to the success of the program is that one clinic coordinates all aspects of a participant’s medical care. San Francisco patients enroll in a “home clinic” where their clinic doctor then decides with the patients when they need any specialty care at a hospital. Buice also pointed out that with one primary provider coordinating all the care, the problems of more fractured and uncoordinated health systems have effectively been avoided. The issue of patients going around to different providers to fill out multiple prescriptions for opioids has been stopped. One primary provider is much better able to detect and then block this abuse. Because the city already has an extensive safety net of primary care providers in place, the program focused more on rationalizing the care provided and giving clients ownership of it, Buice explained. HSF may have been groundbreaking in other ways. “Before ACA (the Affordable Care Act), our program did not care if you had pre-existing conditions, so we were pioneers in many ways,” Alice Kurniadi, manager, office of managed care at the San Francisco Department of Public Health, told WhoWhatWhy. And supporters cite other benefits of the program’s rationalization and coordination of existing services. According to the US Census 2016 American Community Survey, 96.7 percent of San Franciscans now have healthcare coverage, well over the state average of 92.7 percent. When you add in the “City Option,” another health program run by the city, that figure comes close to 100 percent. San Francisco’s Health Care Security Ordinance (HCSO) requires certain San Francisco employers to make healthcare expenditures on behalf of their eligible employees. SF City Option is one option for Employers to satisfy this Employer Spending Requirement. Other gauges also highlight the program’s successes. A 2011 report detailed how three-quarters of HSF’s participants visited a doctor in the first year of the enrollment while visits to more expensive emergency room care declined; at the same time there was a drop in preventable hospitalizations. San Francisco is not alone in trying to solve the problem of universal healthcare access. Four and a half years ago, Los Angeles County launched its My Health LA Program. My Health LA has much in common with Healthy San Francisco. It uses that county’s existing health infrastructure for a health access program for those who can’t qualify or can’t afford other types of coverage. Perhaps it was no coincidence. Mitchell Katz originally oversaw the launch of Healthy San Francisco while serving as director of health for the San Francisco Department of Public Health. In 2014, while leading the Los Angeles County Department of Health Services, he oversaw the launch of My Health LA. While there are similarities between the two programs, there are differences as well. “While Healthy San Francisco charges fees to participants, My Health LA has none. There are also different income eligibility guidelines between the two programs. And with a projected 163,000 members, My Health LA serves significantly more patients than Healthy San Francisco,” Courtney Powers, director of Government and External Affairs for the Community Clinic Association of Los Angeles County, told WhoWhatWhy. Nevertheless, both programs are geared toward providing low-income residents, who are not eligible for and cannot afford other health programs, access to basic healthcare, regardless of immigration status. And Los Angeles is not the only large jurisdiction to follow San Francisco’s lead in providing universal health coverage to all of its residents. A few weeks ago, New York Mayor Bill De Blasio announced the NYC Care program. The announced goal of the program is to provide care and coverage to all residents of the City of New York. Mitchell Katz will be overseeing it in his position as president and chief executive officer of NYC Health and Hospitals. While the two programs have their similarities, Matthew Siegler, senior vice president of Managed Care and Patient Growth for New York City Health and Hospitals, noted some important differences. “NYC Care is larger and more comprehensive … NYC Care is targeting a population of 300,000 … The range of benefits is much greater than Healthy San Francisco or (My Health LA),” Siegler told WhoWhatWhy. Specifically, NYC Care includes the cost of psychotherapy, where Healthy San Francisco does not, Katz noted. As far as this program being a model for other cities and counties, there is a consensus among some healthcare professionals on where such an approach would likely succeed. If a locality had the health infrastructure in place, then it is much more likely that a universal healthcare access program modeled after San Francisco’s, Los Angeles’s, or New York’s could succeed. But even the program’s staunch supporters recognize that healthcare conditions vary by region. “If your hospital is closed and you have nowhere to go, giving everyone access to healthcare if they have no hospital isn’t going to help them,” Buice said. On the other hand, advocates agreed that the San Francisco model could be helpful for jurisdictions with a strong network of safety net providers, who are looking to coordinate care. And several cities have expressed an interest in the program. New Orleans, Denver, Pittsburgh, and Miami have contacted the San Francisco Department of Health for technical assistance in determining whether the program would work for them. California Gov. Gavin Newsom (D) has also expressed an interest in seeing whether the Healthy San Francisco model could be applied statewide. But the program is not without its critics, in particular because it includes coverage for undocumented immigrants. “Personally, I resent paying the Healthy SF tax for mainly undocumented workers on my restaurant bills in San Francisco as I am already paying for my own health care”, Sally Pipes, president and CEO of the San Francisco-based Pacific Research Institute, said recently. She added that the program’s coverage for undocumented immigrants only encourages more immigrants to come to California. Supporters of these programs disagree. Bob De Luna, press secretary of the New York City Health and Hospitals Corporation, noted that Americans currently pay the healthcare costs for undocumented citizens in the most expensive way possible — through emergency room visits. If NYC Care is successful, visits to primary care physicians would replace emergency room visits, lowering healthcare costs, he asserted. And in the two cities where these programs have been on the books a number of years, there is little evidence this backlash is gaining any traction. The City of San Francisco has always been supportive of the mission and goals of the program and it is well-known and popular with the people of San Francisco, Kurniadi said. “The Los Angeles Board of Supervisors unanimously voted for a new contract with additional investments (in My Health LA) just recently,” Powers said. But there is one caveat. Los Angeles, San Francisco, and New York are all highly diverse and deep blue cities. It remains to be seen how well a program promising healthcare access to clients regardless of their immigration status, would play in the redder areas of America. Stopgap for Those With No Options. Even the strongest supporters of these programs recognize their limitations. Spokespersons interviewed for all three health access programs viewed them as supplemental, stopgap measures for those people without any other healthcare options. “We see NYC Care as complementary to the Affordable Care Act … or a single payer system,” Siegler said. 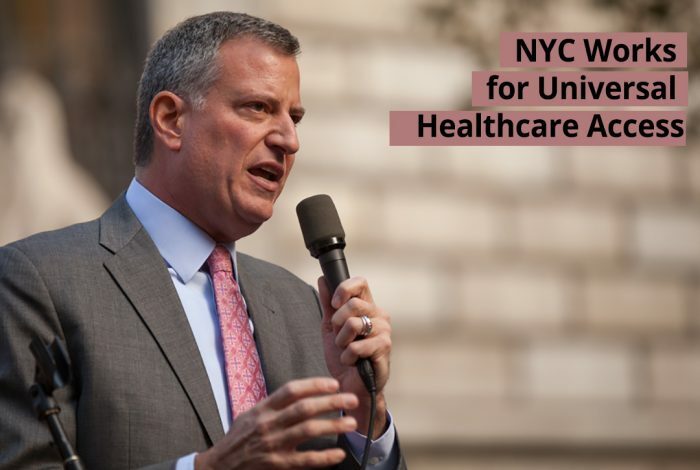 The fact that none of these programs provides (or in the case of NYC Care, will provide) access to healthcare outside of jurisdictional limits is a shortcoming. For example, if a San Francisco resident has an accident in Oakland, HSF will not help cover the costs of a hospital stay or doctor’s office visit in that city. Also, some of these city programs may not provide the same range of benefits that other healthcare programs offer. For that reason, if Newsom is successful in extending the cut-off age of the Medi-Cal program — from 18 to 26 — then those patients will be covered by Medi-Cal, Powers said. In addition, it would mean that under Medi-Cal, their medical coverage would be expanded statewide, and not just limited to Los Angeles. Since the midterms, Democratic office holders have shown new interest in expanding healthcare coverage and bringing down costs. Gov. Jay Inslee of Washington State (D) made passage of a public healthcare option a top priority in the state legislature. Newly elected Colorado Gov. Jared Polis (D) has come out in favor of a single-payer system. New Mexico legislators plan to introduce a Medicaid buy-in bill soon after their new session begins. Indeed, what happened to HSF’s enrollment about six years ago may be a harbinger for other sections of the country. Before the Affordable Care Act was up and running, HSF had 60,000 participants. After the ACA became operational over the next few years, enrollment in HSF dropped to below 14,000. These new initiatives don’t seem to bother proponents of the three programs. “We see Healthy San Francisco as something that is there if somebody doesn’t have any other options, but we always want to support and promote individuals to go to the program that is best suited for them,” Kurniadi said.